EPC Group’s branding and responsive web design (RWD) consulting and development services offer your organization a governed custom “look and feel” that is both browser and device agnostic. Our approach combines over a decade of custom development experience with EPC Group’s industry leading SharePoint, Office 365 and custom application business analysts to ensure the underlying business requirements are translated into the master pages, templates and other custom design elements. EPC Group’s branding consultants and graphic designers work closely with you to review individual branding & custom requirements and then compare them with the out-of-the-box capabilities of SharePoint 2019, Office 365 or SharePoint Online to define the exact level of effort required to deviate from any native features to meet your specific branding elements. Many of our clients gain a great deal of insight through this approach to understand what is available out-of-the-box versus the granular requirements they have defined and then, together with EPC Group, review what will provide the most ROI for the available branding budget. EPC Group’s branding and responsive web design practice offers a complete turn-key engagement model from requirements review to initial mockup design all the way through custom app, master page, theme and navigation as well as any other feature desired by the organization to meet the needs of the business. We also have a large “gallery” of custom navigation solutions, news, streaming videos, audience driven announcements, custom calendar and other features so that, in many cases, we are able to tailor an existing custom feature to the needs of your organization without “reinventing the wheel”. EPC Group’s consultants are industry leaders in mobility as well as responsive web design and will ensure that your custom branding initiative meets both your short and long term goals. Our design and development also supports the targeting of different devices such as specific smartphones and tablets and can create channels that allow a single publishing site to be rendered in multiple ways by using different designs that target different devices. 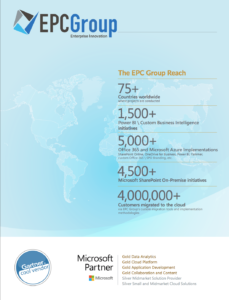 EPC Group provides mobility, BYOD and mobile device management (MDM) consulting services that will help increase user adoption and open new possibilities to your organization’s user base to ensure the long-term success of your SharePoint 2019, Office 365, Microsoft Azure or custom application development initiative. EPC Group approaches the information architecture (IA) and security design of your organization’s user base from a device-centric approach. EPC Group will provide for a common user experience which is both device and browser agnostic. We deliver our time tested “from the consulting trenches” strategies and related policies for your organization which follow a Responsive Web Design (RWD) user interface (UI) design for your SharePoint 2019 or Office 365 sites, communities and branding elements, as well as in all aspects of custom development. EPC Group’s SharePoint responsive web design (SPRWD) methodology, a SharePoint specific responsive design approach, will provide your organization’s users an optimal viewing experience with common “content reading areas” and device/browser agnostic navigation that will allow for functions such as panning, scrolling and resizing across devices. EPC Group will provide detailed planning from both the business and technology perspectives to companies both small-to-midmarket as well as large enterprise organizations. If you are a large or global organization, or one that has users in multiple locations, in various countries or possibly spread throughout the globe, EPC Group will provide you with a user experience and related responsive web design from a “device channel” perspective to ensure seamless mobile device management. “Remote workers” as well as “internal/onsite workers” empowered with “bring your own device” (BYOD) policies can push the boundaries of IT and typical IT-driven culture. A lot of IT organizations are playing catch-up in the areas of governance and their information management policies and have pushed back on BYOD due to the added complexity around security and compliance it brings and the way it ultimately forces specific polices to be approved. EPC Group will help your organization navigate the questions around the “trade-off” between not allowing BYOD and the work required to actually implement a BYOD strategy as well as address the risks of “shadow IT” in users finding shortcuts and utilizing other methods or access points to share files or obtain reports. EPC Group has provided our clients with measurable productivity increases with a tailored BYOD policy that comes with empowering users. We will help you navigate the balance of privacy in conjunction with other obligations such as legal risks that may come with personal or PII/PHI data. We provide internal BYOD policies that follow tailored password requirements and pins as well as provide integrated technology with a layer of file encryption. EPC Group will enable your organization’s users to securely access content stored within your SharePoint 2019/Office 365 environments or ECM platforms regardless of the remote working environment. Our experience in developing and designing enterprise wide strategies around BYOD as well as in areas such as cloud or hybrid computing has given EPC Group years of added experience and real world working knowledge that you will not find in another technology partner. EPC Group also offers integrated solutions that can be implemented on your existing infrastructure around device locking as well as remote wiping if a device is lost or stolen and for secure backups, certificate/encryption and virus protection.